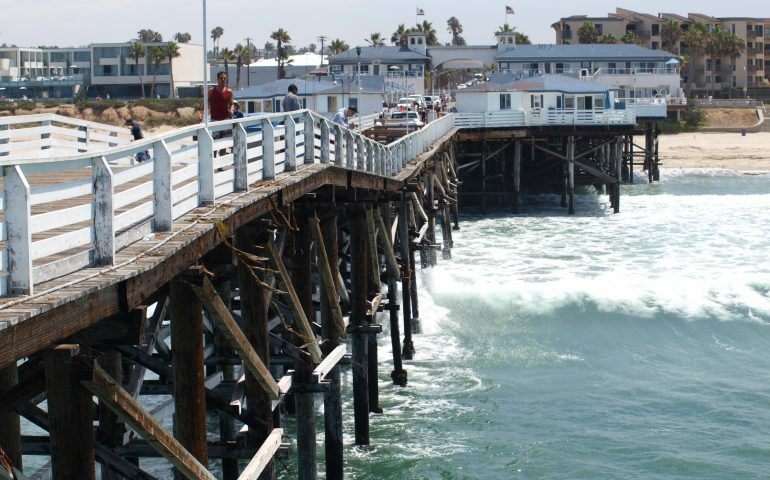 The best pier to fish for halibut during every season would be Crystal Pier (privately owned, fishing pau as soon as sun sets). [Pau means finished or done in Hawaiian—KJ] Try live anchovies if you don’t mind buying bait or live smelt (3-4” is the best size), which you can hook easily using Damashi. Fish a moderately high tide straight between the pilings (egg sinker, barrel swivel, 2’ leader, and preferably an AH hook brought back from Hawai‘i)–the best, I think, is just beyond the last motel units on the pier. The two inside corners of the “T” at the end is another good spot to try. The middle portion—waste time, I think. Leave the egg sinker above the bottom by about 1/2 the length of your leader, which should be 10-15lb test fluorocarbon. You can also try lures but waste time in my opinion. Spring is also sometimes good for yellowfin croaker (ono—the meat is firm like ahole without many bones—use bloodworm or mussels about 10-20 ft. feet away from pier from the middle to 3/4 out), barred surfperch (inshore to 3/4), walleye surfperch (middle to end) smelt and queenfish (middle to end), the occasional mackerel (3/4 to end), the infrequent calico bass (sneak a big overhand cast straight out from the end—and watch out for huge kelp paddies) and, of course at this pier, large shovelnose. You might consider trying for this last, as the meat in the tail is ono and the fight is better than most fish you can catch from a pier in San Diego. Pretty good fun even by Hawai‘i standards. Watch out for the lobsters, which may start to return inshore during this time period (we caught couple big ones in April one year, using a net, of course…). Watch out for the ubiquitous tourist (harmless, but annoying) and surfer (not harmless, and at times very irritating)—if the latter should shoot the pier, do me a favor and drop a big pile palu (smashed mussels, tomato sardines and bread—whatever) on the head. Fished Crystal from 11-1pm today. Conditions were decent and in the two hours I pulled in a Leopard, Grey Smoothhound, two big Thornbacks, and some Walleyes on the Sabiki. Not exactly what I was looking to catch, but fun anyway. Tried right past the surf line on the south side about halfway out. I know there are YFC and Corbina in that surf line, maybe next time. Didn’t really see anybody else catch anything while I was there. I’m pretty sure it’s illegal to do it from shore, but if someone’s last wish was for me to spread their ashes there I’d do it in a heartbeat and just be prepared to pay the price. Ed ps. If you happened to see ashes along the shore just outside of Bodega Bay last January it may have been my uncle Tilio who had a similar wish. Saw my first ever black sea bass caught from a pier yesterday. I and three other fishermen on the pier were kicking ourselves for not having our cameras with us. Mine was in the car; I had all the intentions in the world to bring it out on the pier, but alas the excitement of getting out on the pier got in the way of my diminished memory. When the lucky guy hooked up, we all thought he had a large bat ray. Hardly any runs and a slow hard steady tug. It was taking awhile so I went back to catching the mighty smelt (sarcasm mood on). I totally missed how they got it up on the pier and only saw it as it hit the deck with a big cheer from the gathered crowd. Some say it was 50 plus lbs. to me it looked more like 25-30 lbs. maybe 36-40 inches long. To their credit the fisherman and the folks helping him wasted no time getting it back in the water. BUT NO PICTURE!!! As far as I could tell he was using 30-lb mono on a Shimano Baitrunner (4500 or 6500?) with a quality pole, baited with a whole squid. Went to Crystal Pier yesterday morning and caught a rock wrasse, which is the 53rd different fish I’ve caught at the pier. And the crazy thing is that I caught it on a Sabiki, along with a lobster, and a small sand bass, all on the same line! I was also able to get about a 3-foot-long shovelnose guitarfish but overall it was another slow day at the pier. Several weeks ago I heard about a 42 pound yellowtail landed at Crystal Pier. Needless to say I was a little skeptical, but in talking to a couple of regulars and one in particular that took a picture of it, I became a believer. I guess one of the earlier pictures floating around the net was from a cell phone camera. This picture was from a film camera, and today while at the pier the photographer had some copies. He was kind enough to give me one for all of us to enjoy. This year has truly been a great one here in San Diego. Lets hope next year is even better. Hate to be “that guy”… but that is not a 42 lb. yellowtail, unless that gentleman is like, 6’5”. It goes without saying, however, that it is an amazing and rare catch from any pier! It might not be exactly 42 lbs but it’s a big fish anyway from a pier. Congrats for him whoever he is. The fish might look smaller because they way he’s holding it makes the fish bend a little.